When I was about to take the picture of the Missionary Image of Our Lady of Guadalupe (referred to as the GD photograph below) in the church at the National Shrine of Our Sorrowful Mother (the Grotto) on August 15, 1991, I felt helpless because of the expectation that the reflection of the camera flash would ruin the photograph, but God turned this predicament on my part into something so wonderful by using the light from the camera flash. When a friend of mine in Los Angeles saw the reflection of the camera flash in this photograph, he commented that the reflection of camera flash normally appears on the photograph as circles and not as straight rays beaming in all directions as seen in the GD photograph. Chris, our son, also mentioned that it was amazing that one of the rays of light was bent to form the top contour of the Blessed Mother's head, completing her kneeling image within her GD Image. Chris is also an eyewitness, as he was standing by me when I was taking this photograph. When I first noticed the images of the Eucharist and little babies in the photograph, I was not sure if these images were miraculous or just random accidents. What gradually convinced me were, especially, the images of (1) the Holy Spirit above the Blessed Mother's right shoulder and (2) her kneeling and weeping, also containing the images of little babies. What is seen as the image of the Holy Spirit is the reflection of one of the high windows in the church and tree leaves outside the church. For the first several weeks when I had not recognized the image of the Holy Spirit yet, I had been thinking that, if this reflection of the window had formed an image of the Holy Spirit, it could have been more convincing that this photograph was a miraculous work. Then, a lady in Scottsdale, Arizona, informed me that there was an image of the Holy Spirit in the photograph. With this new encouragement, I carefully re-examined the photograph, especially the reflection of the window above the Blessed Mother's right shoulder. Finally, I was greatly surprised to see the image of the Holy Spirit looking at the Blessed Mother and also at us! Once I recognized it, it looked so clear and obvious. The Missionary Image of Our Lady of Guadalupe from Mexico arrived in Portland on August 1, 1991. Three days earlier, on July 29, 1991, in the afternoon, the entire sky suddenly became covered with black clouds looking quite threatening. We expected a heavy rain. Then, instead of a rain, large hailstones, as large as golf balls, poured down making terrible noises. We were very worried that the roof of our car parked on the driveway would be damaged, but it turned out to be okay. When the downpour finally passed, the ground was all white with lots of hailstones and the air was filled with some strong pleasant scent similar to that of cedar. We had never seen such large hailstones and saved some in the freezer. After the hailstorm, the sky was clearing and a beautiful rainbow appeared with an intense brightness that we had not seen before. Also, the entire sky under the rainbow turned bright golden yellow. This display of the powerful rainbow was so beautiful and shocking that I took a few photographs of it. Many of the people in Portland probably missed this scene, because they must have stayed indoors to avoid being hit by the hailstones. After quite a while, the rainbow faded away and, instead, intensely red and black clouds covered the western half of the sky, while the sun was about to set. It was a terrible scene looking like a vast sea of violent fire. This reminded me of what I had heard about the predicted Great Miracle followed by the Chastisement. I also remembered a story in The Poem of Man-God (I do not read this book any more because of a negative statement from the Vatican. I am not sure if all of the contents of this book should be rejected), in which the people in the old Israel saw a powerful rainbow in the ivory-color sky just before the Birth of Our Lady. Three days after this hailstorm and the rainbow, the Missionary Image of Our Lady of Guadalupe arrived at the Portland International Airport. The day I took the photograph of this Image was two weeks later, August 15, 1991, which was the last day of the Missionary Image in Portland, Oregon. Could the rainbow have been a sign of something important and spectacular to occur on August 15, 1991, the Solemnity of Our Lady's Assumption, in Portland, Oregon, the world capital of roses? Going back to several months before this event, in May 1991, my family wanted to formally consecrate ourselves to the Sacred Heart of Jesus and the Immaculate Heart of Mary. After the Sunday Mass at St. Birgitta, a small Croatian church in Portland, we (four of us: my elderly mother in a wheelchair, my wife, Chris, our 11 year-old son, and myself) entered the Blessed Mother's chapel next to the main church and together read the prepared prayer of consecrating ourselves to Our Lord and Our Lady. Later we realized that Our Lord and Our Lady took our consecration seriously and were giving us a series of work to do. Of course, we were also serious about the consecration but did not expect that things would begin unfolding so soon. A few weeks after the consecration, in June 1991, we attended Mass at the same church. As we were coming out of the church after Mass, Chris was feeling uncomfortable in his stomach and vomited into the trash basket in the car. Because we had not eaten breakfast yet, his vomiting was brief, but I was startled to think that he must have vomited the Eucharist. We could not see any solid objects come out of his mouth. If the Eucharist came out, it must have been in the liquid state. In the trash basket, there were an apple core and a few crumpled sheets of Kleenex. When we arrived home 30 minutes later, I thoroughly washed everything in the trash basket with water collecting the water in a bowl, and drank it. We prayed that the Lord would have mercy on us for what happened to His Eucharist. I write about this incident, only because I think there is a possibility that it might have been a test from above about our faith in the Real Presence in the Eucharist before receiving the GD photograph a few weeks later. Several days after the GD photograph was taken on August 15, 1991, Chris and I began our first-ever trip to Europe from August 20 including a pilgrimage to Lourdes for three or four days. Throughout the trip of 11 days (except the first day), Chris could not eat or drink anything but water. To him, it became a real, hard pilgrimage, as he suffered much, even though he was not complaining and seemed to enjoy the trip. I was very worried and tried to shorten the trip and go home early, but it was not possible. I also had a business appointment with someone from England at a trade show in Frankfurt, Germany. When we finally came home, Chris appeared fully well and began eating the foods prepared by his Mom without any problem except that he lost weight and this worried his Mom. It was only after that trip that the rolls of film were developed at Costco and we first saw the image of the Eucharist in the photograph taken in Portland before the trip. In the mid-October of the same year, I made a business trip to Korea and, on October 19, Saturday, visited Naju for the first time. I saw tears in the Blessed Mother's left eye (on her statue), smelled an intense sweet fragrance of roses in the chapel during the all-night prayer meeting of October 19 celebrating the 5th anniversary of the Blessed Mother's first weeping tears of blood in Naju (I went to Naju without knowing about this anniversary), and met Julia Kim and her family in the early morning of October 20. When I said Good-Bye to Julia, she surprised me by saying that the Blessed Mother wanted me to stay three more days. I was not only surprised but also perplexed because I only had three days left in Korea including a Monday with an appointment with a company in Seoul. Is it possible that the Blessed Mother did not know that I only had three days left in Korea and had more work to do in Seoul? No, it was not possible, but I had to wait until later for the correct answer. I said to Julia that I could not stay. She seemed disappointed, but invited me to the breakfast in her home located next to the chapel. I promised her and others that I would translate the messages and spread them in the United States. Only several years later, I finally understood that the Blessed Mother was calling me to be a full-time worker for her when she was asking me to stay three more days. Also the GD photograph taken two months earlier (on August 15, 1991) became perceived more clearly as a sign of that call. Actually, the GD photograph was the first sign from the Blessed Mother, and soon afterwards this sign became connected with the signs I was receiving through Naju. When I finished the translation of the messages into English in May 1992 and express-mailed it to Fr. Raymond Spies, Julia's spiritual director, for his approval, Fr. Spies smelled an intense fragrance of roses from the package and also noticed that the package was soaked in fragrant oil. He told me this by calling me at 1:30 a.m., Oregon time, and gladly approved my publishing the English message book. In October 1992, I went back to Naju, this time with Chris, and also visited Fr. Spies' residence in the southern suburb of Seoul with one box of the new English message books as a gift to him. Fr. Spies was happy to see the English message book and talked (in Korean) for about two hours. He especially emphasized the need for the lay people's role for revitalizing the Church in this End Time. (Since then, this English message book has been translated into dozens of other languages in Asia, Africa, Latin America, and Europe by the motivated local volunteers.) At first, I wanted to do the work for the Blessed Mother with some of the revenues from our family business, but soon I realized that my work for her should be done as a total dedication and full-time work. In late 1992, we registered with the State of Oregon and the IRS as a non-profit corporation, even though there were only four of us in the family. Both my mother and my wife converted to the Catholic Church from the Presbyterian faith in 1980. I became a Catholic after high school (1964), after reading the Catholic teachings and the Lives of the Saints over the period of two years during high school. I had become interested in studying the Catholic Faith not to convert to the Catholic Church or because I had complaints against the Protestant faith but to know more about the entire Christian history without any prejudice. I could not blindly accept the widespread notion that the Catholic Church had become corrupt and Luther had to build a reformed church in the 16th Century. I finally concluded out of my conscience that the Church established and led by God could not be rebuilt by any humans regardless of the imperfections among her members. I was convinced that the Catholic Church stands on a divine foundation, as Jesus, her Founder, is divine and is being led by the Divine Will and Power, as the Holy Spirit guiding and animating her is divine. I was baptized at Kye-San Cathedral in Taegu, Korea, on September 25, 1964, which was then the Feast of the Korean Martyrs. Our first spiritual director was an elderly priest from Croatia and, at that time, the pastor of St. Birgitta in Portland. About a year later (1993), he permanently moved to Croatia for his health reasons, and we had to find a new spiritual director. We asked Fr. Robert Billett, C.M.F. in Los Angeles, and he promptly consented. During an earlier visit to Los Angeles, we attended a Mass at St. Basil Church celebrated by Fr. Billett, and we were deeply impressed by his homily. After the Mass, we gave him a photo album of the events and miracles in Naju. He met Julia when she visited Los Angeles in 1993. Fr. Billett wrote several articles for our publications including: "The Church and Recent Revelations" and "History of the Miraculous Medal". We have been so fortunate and blessed to have Father Billett as our spiritual director. Julia visited several cities in the United States again in 1994 and (Toronto, Canada also) 1997. I worked as her interpreter when she gave her testimonies in churches. She also visited Hong Kong and Macao in 1997 and the Philippines in 2005. During some of her visits including the one to Indonesia in 2008, others interpreted for her. In 2008, I went to Rome with Fr. Aloysius Chang, an adviser to Julia, and, in May 2011, I joined her and her Korean companions during their trip to Rome to visit the Congregation for the Evangelization of Peoples, which is responsible for guiding the Church in Korea, as Korea is still considered a mission territory by the Vatican. Drops of the Lord's Precious Blood came down immediately after some of the Masses in the hotel in Rome, as they often do in Naju. So far, several priests including a high-ranking priest in the Archdiocese of Portland in 1991 have expressed their explicit belief in the supernatural nature of the additional images in the GD photograph. They are not making public statements now out of their respect for the authority and duty of the Bishop. We know there are some people having difficulty in finding the images in the photograph, but this is understandable, as I also experienced it at the beginning. Once the images are recognized, they look so clear and obvious. The GD photo is a heavenly gift not for a few individuals only but for everyone in the world. 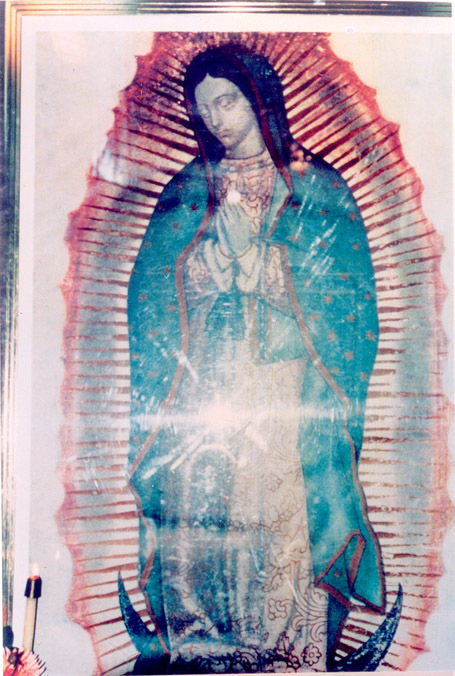 This GD photo does not weaken the original Image of Our Lady of Guadalupe but enhances its importance by manifesting certain images that had been hidden before. The emphasis of this GD photo is on (1) our firm and correct devotion to the Holy Eucharist; (2) our fervent devotion to the Holy Spirit; (3) our urgent and essential need to love and trust Our Heavenly Mother and seek her help to succeed in overcoming the crises in the world and in our lives; (4) her approaching Triumph over the devil; (5) the need for ending all abortions, (6) its connection with Our Lady's messages and signs in Naju, Korea, and (7) our urgent need to repent our sins and do penance for our salvation and eternal life. Some color brochures on Our Lady of Naju, Korea, will also be enclosed at no extra cost. This offer is good in the United States only. In other countries, please inquire about the estimated cost by writing to the above address or by email to director@marys-touch.com.